I'm such a proud Auntie:) Even though I'm far away and haven't seen him yet, I love him already! 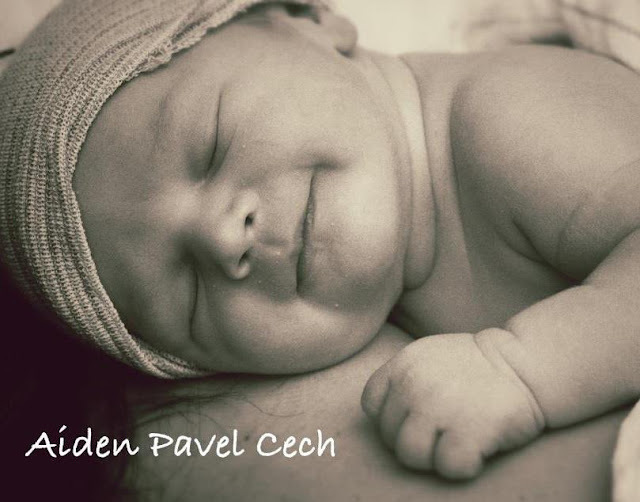 His name is Aiden Pavel Cech. He was born yesterday 11/22/11, weighed 8lbs 1ounce, and was 20 in long! I got to talk with my sister Helen twice yesterday and she told me that he has been smiling in his sleep:) I'm hoping to be able to skype into the hospital today which would be awesome. I can't wait to see him! 30 more days and I will be home for Christmas! Congrats on your cute nephew! He is so precious. I bet you can't wait to hold him and smother him with hugs and kisses?! !